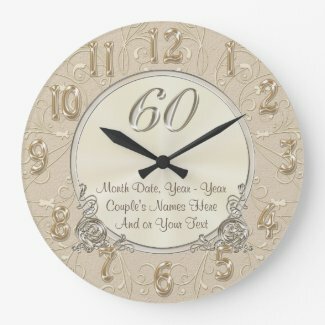 CLICK the image above to see many more beautiful Personalized 60th Wedding Anniversary Gift Ideas for parents, grandparents, your family and dear friends. 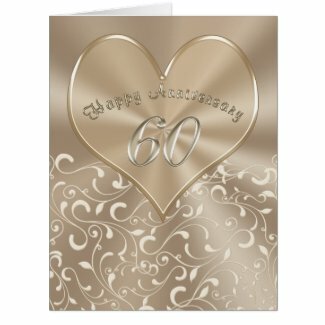 We also designed gifts for 60th wedding anniversary and 60th wedding anniversary party supplies that do not require any personalization. 1 Text Box Template to type in 3 Lines of Special Anniversary Message or Your Text. Couple’s Wedding and or Anniversary Date, their Names and Your TEXT or Delete any or all of the text. You will be pleasantly surprised when you see how nice these Custom Anniversary Gifts are and reasonably priced too. 4 Lines of YOUR TEXT or Delete. Gorgeous Anniversary Plates for the most special anniversary they’ve ever shared. It is so incredibly wonderful it deserves to be recognized. Give a gift that doesn’t take up room. Plates can be hung on the wall or placed on plate holders. Wait until you see the smiles, especially the sixtieth anniversary couple. They will love the personalized 60th anniversary gift. The other side shows the separate Taupe Hearts with a tinge of golden color. The Front shows the Two Hearts Joined as One with their Names or Your Text below. I can create these in any Color and Text. They will love sharing their morning Coffee or Tea in these special personalized anniversary mugs. Please feel free to contact me, Little Linda Pinda, to create a super special and memorable anniversary gifts for you and your family. These mugs are my best selling in the 50th anniversary gifts, I finally created them for 60th wedding anniversary gift ideas. Any gift can be change for ANY YEAR anniversary. 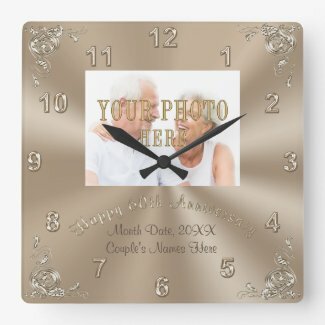 Photo Anniversary Gifts for Couples Married 60 Years or I will redesign these anniversary clocks for ANY YEAR in ANY COLORS. Lovely neutral tones for most decors. 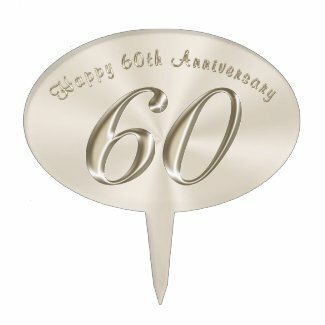 Zazzle will send directly to their home or you can it bring to the 60th anniversary party. Type their Names, Date(s) and or Anniversary Message into text box templates located to the right of each gift on the product page. What is the Traditional Symbol for 60th Wedding Anniversary? Diamonds are the traditional Sixtieth Wedding Anniversary Symbol and 60th Anniversary Gem Stone. In light of this, if you don’t wish to give diamonds, I created gifts with a gorgeous and rich Platinum look. This neutral coloring lends itself to many various decors. The clocks can go in a variety of different rooms, such as the living room, bedroom and kitchen. Did you ever think they might love to have a clock in their bathroom to keep an eye on the time. I FINALLY made myself a Zazzle anniversary clock for my bathroom. It makes it so much easier than trying to “judge what time it might be”. 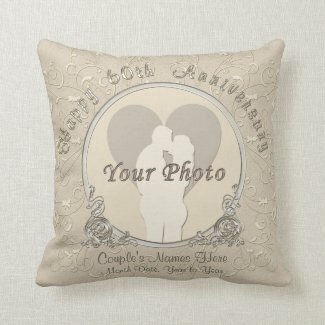 The Sixtieth Anniversary Pillows will be wonderful in the couple’s bedroom or living room. They will be so proud to show off these beautiful gifts from their dear friends and family. Although these gifts are not the traditional 60th wedding anniversary symbol or gem it reflects the elegance of platinum look. A silvery golden tone which lends itself to many decor situations. I think most people could use a clock in a room that doesn’t have one yet. I just created a clock for my bathroom with these tones remembering my husband and my anniversary of twenty two years. Taupe and platinum are one of my favorite decorating color combinations. So, instead of giving diamonds as a 60th anniversary gift, these are nice and memorable gifts. What is the Traditional and Modern 60th Wedding Anniversary Symbol? Diamonds. Yes, diamonds are both the traditional and modern wedding anniversary symbol. Diamonds are also the modern and traditional wedding anniversary symbol for 75th anniversary. Thank you for visiting our 60th Wedding Anniversary Gift Ideas article. Please feel free to contact me if you would like me to create a 60th anniversary gift for you. At this time I am offering a free design service and you are not obligated to purchase the gift if it is not meeting your expectations. Unique and affordable sixtieth anniversary gifts that will be extra special for a wonderful memory of their big day.